THE GREATEST SONGS OF THE SIXTIES once again marks a reunion between Manilow and Clive Davis, Arista founder and BMG U.S. Chairman & CEO. The two produced The Greatest Songs Of The Fifties together, and that magic has carried over to the new album as well. Each song on THE GREATEST SONGS OF THE SIXTIES is a classic in its own right – from his remake of the Righteous Brothers “You’ve Lost That Lovin’ Feeling’” (1965) to the Beatles’ “And I Love Her”(1964), to Herb Alpert’s “This Guy’s In Love With You” (1968), the Lettermen’s “When I Fall In Love” (1962) and Burt Bacharach’s “Raindrops Keep Falling On My Head” (1969). Like the marvelous musical decade of the ’60s itself, the album covers many genres, from its recollection of Herman’s Hermits’ “There’s A Kind Of Hush (All Over The World)”(1967), to Bobby Vinton’s “Blue Velvet” (1963), to Jackie DeShannon’s “What The World Needs Now Is Love” (1965). Manilow also pays tribute to some of America’s greatest singers, whose memories are evoked on songs that are forever associated with them, including Dean Martin on “Everybody Loves Somebody Sometime” (1964) and Frankie Valli’s “Can’t Take My Eyes Off You” (1967). Two artists whose legacies were recalled on The Greatest Songs Of The Fifties are again paid homage on the new album, namely Elvis Presley with “Can’t Help Falling In Love” (1962) and Frank Sinatra with “Strangers In The Night” (1966). One of the highlights of the album is a great duet with The Association of their two #1 hits “Cherish” (1966) and “Windy” (1967). 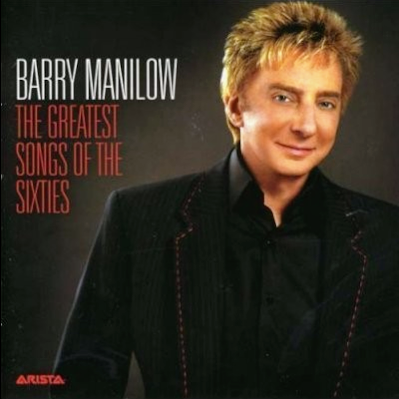 With THE GREATEST SONGS OF THE SIXTIES Barry Manilow pays a loving and welcome tribute to some of the songs that inspired him to become one of the most beloved performers in pop music of the past three decades.